How to drive from Melbourne to Tower Hill - there are three options. From Melbourne (Westgate Bridge) you have a choice of 3 different routes to Tower Hill House. Download the relevant one page pdf and you'll be here in no time at all. Via Lismore and Mortlake (Hamilton highway)… 2 hours and 45 minutes. The local route - and surprisingly fast. Via Colac and Warrnambool (Princes highway)… 3 hours and 30 minutes. Via Lorne, Apollo Bay and Port Campbell (Great Ocean Road).… 7 hours. A fantastic drive, but allow all day. 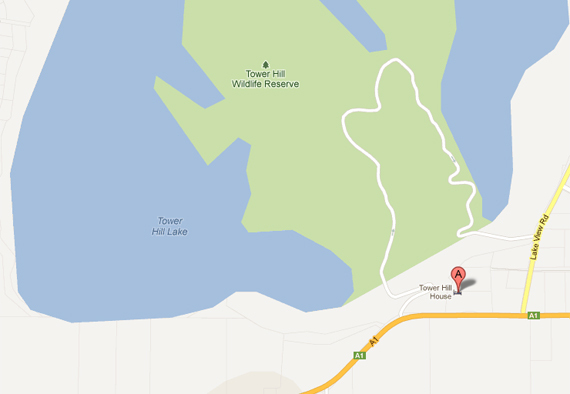 How to get to Tower Hill House, if you are travelling from Western Victoria and South Australia. Directions from Western Victoria and South Australia.